Logitech MK270 VS MK320 Wireless - Which one to buy? You are here: Home / buying guides / Logitech MK270 VS MK320 Wireless – Which one to buy? 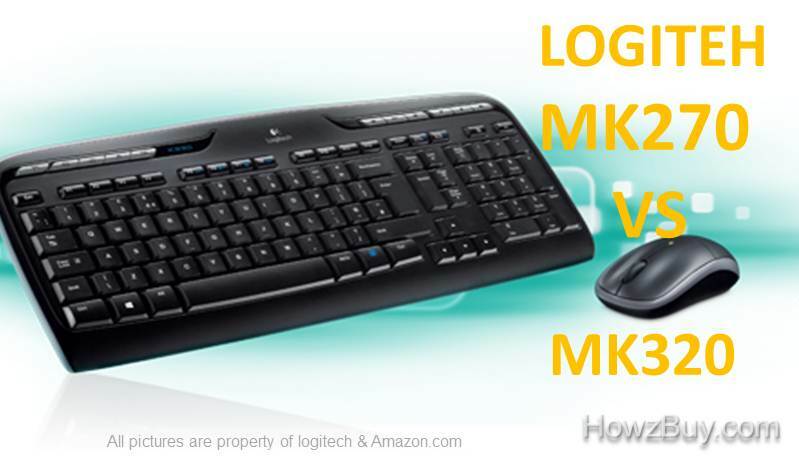 Logitech MK270 VS MK320 Wireless – Which one to buy? If you are looking for a good wireless keyboard and mouse combo, you can refer my review for choosing the keyboard and mouse combo. KEYBOARD AND MOUSE COMBO – Logitech MK270 wireless keyboard and mouse combo is a great option for good combo of keyboard and mouse. The keyboard is very responsive and great to use. And the mouse is a great addition as well with its amazing DPI. All of these products combined with the insane battery life of this keyboard and mouse makes for a very high-quality product. EASY STORAGE – a keyboard and mouse that incorporates the same reliable 2.4 GHz connectivity. That eliminates delays, dropouts, and interference with a 30-foot range of motion. Keyboard and mouse both are plug and play on Mac, Windows, and Chrome OS. so you can easily plug the low-profile receiver into a free USB port. Hence, you will be typing wirelessly and navigating in no time. DROPOUT-FREE CONNECTIVITY – Using Logitech’s device-networking receiver keyboard and mouse combo connects to your PC that allows you to sync your keyboard. The computer instantly identify both devices without any software installation and allows you to perform basic typing tasks with reliable wireless connectivity.you’ll never have to suffer through dropouts because the 2.4GHz signal ensures you have a strong and reliable connection. Shortcuts at your fingertips- 11 multimedia hot keys and 12 programmable F-keys. hot keys for instant access to play/pause, volume, the Internet, and email. By using F-keys you can easily open your favorite application, folder, and web page. Powerful, reliable wireless connections- Powerful 2.4 GHz wireless connection with one tiny Unifying receiver it stays in your laptop and connects up to six compatible mice and keyboards. the wireless range allows you to work or play in more places. Plug-and-play simplicity– To start using your keyboard and mouse right away, just Plug the Unifying receiver into your computer’s USB port. It Works with Windows XP, Windows Vista, Windows 7, and Windows 8 computers. Type in comfort- Quiet, low-profile keys for smooth typing that’s easy on your fingers, full-size keyboard for more comfortable typing than netbook keyboards and laptop. Logitech MK320 being the latest version of wireless keyboard and mouse combo series provided by Logitech. With every upgraded version comes upgraded capabilities. The MK320 will definitely outperform the MK270 With better range capabilities and the number of hotkeys user convenience is guaranteed. The MK320 is priced less than most of the best keyboard in the market with more than good capabilities. I recommend you to buy this keyboard which could be best for wireless gaming and computing.